A crop circle formation about 700ft long with a snake-like pattern has appeared in a field in Wiltshire. Experts said the formation in Milk Hill represents the transit of the planet Venus across the sun, an astronomical event that started last week. Crop circle researcher Michael Glickman said: “It’s wonderful and enigmatic and I’m convinced it is not man-made. 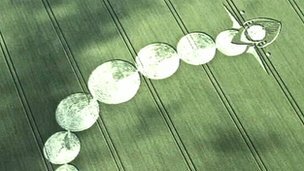 Microlight pilot and crop circle enthusiast Matthew Williams, who photographed the formation, disagrees and said he believes it was created by people who have improved their crop-circle-making skills. He said: “Usually in the season, things develop from basic circles in the beginning to being much more complicated later on. “I would say this formation is a case of people getting up their skills. There are a lot of people out there who make them.